This summer we brought you an array of FREE workshops taking place in libraries all around Warrington! Each workshop included a variety of fun games and activities that were themed around this years summer reading challenge. It also culminated in an Arts Award certification which is a recognised qualification run by Trinity London. We ran 2 day photography and filmmaking courses for 10-14 year olds where they could let loose their creative side and have fun photographing and acting in their own mini films. At the end of the 2 days the kids showed their work to their family in the way of a photo exhibition and film viewing! We also ran half day craft & drama workshops along with stop motion animation workshops to give young people the chance to try something new and different!! Take a look at the movies and photographs from the project by clicking below! The second intake of this course takes place over the course of 12 weeks, starting on the 22nd September and finishing on the 15th December. During the 12 weeks attendees will be introduced to techniques in how to use filming equipment and create films. The group will then work together to create their own promotional film, which will be used by Warrington Council to help promote what they do. During this, the group will also be completing a Bronze Arts Award, which is equivalent to an entry level GCSE. There will also be a trip involved to see an arts event which the group will decide on closer to the time. 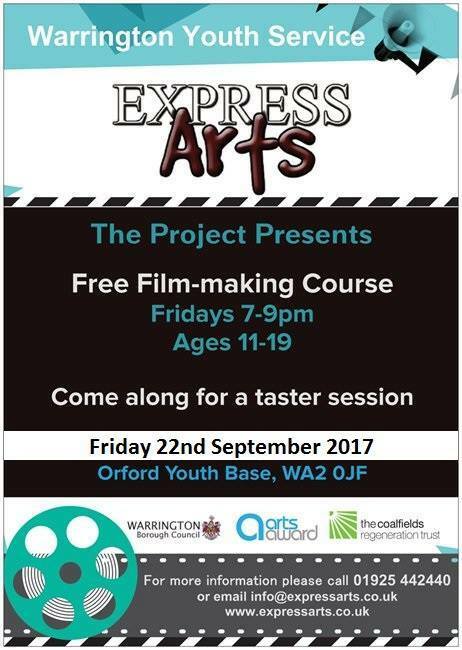 This is a free course as it is fully funded and will take place on Friday evenings 7-9pm at Orford Youth Base. 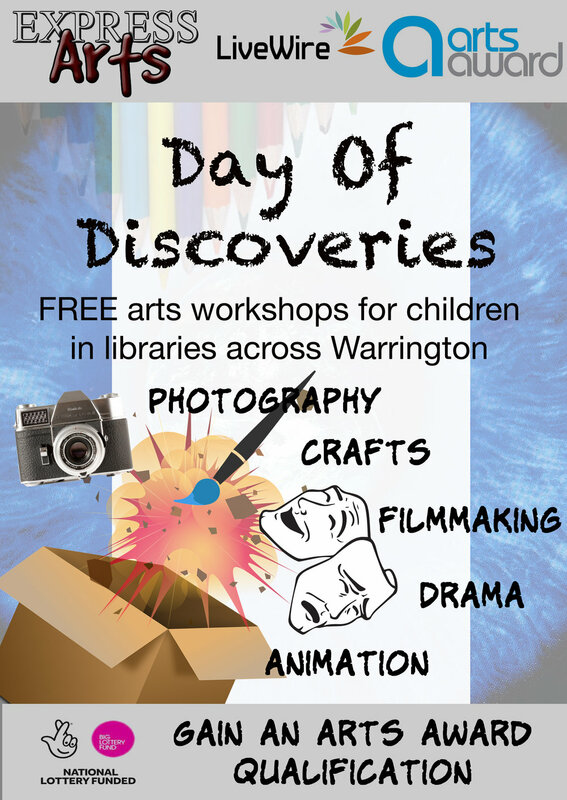 This summer Express Arts brought our successful day of discoveries workshop 4 libraries across the Warrington area! We used craft and drama to explore the summer reading challenge for 2017 which was Animal Detectives. The workshop will took place over 4 weeks in 4 different libraries giving lots of people in the area the chance to get involved! It ran from 10am until 1pm and was available for children aged 5 to 11 years. During the project we helped over 45 young people gain an Arts Award qualification! This project was so successful we are looking upon expanding on this for next summer so keep your eyes peeled! The big Express production of 2017. 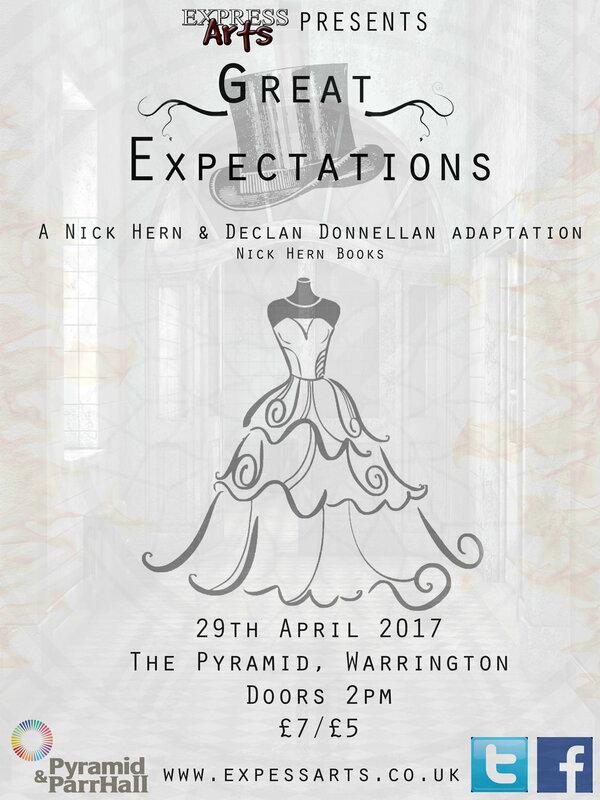 It took place on the 29th of April at 2pm, Our audience found out the story of Pip and how he becomes a gentleman. One of the finest novels by iconic British author Charles Dickens, this Victorian tale follows the good-natured orphan Pip as he makes his way through life. As a boy, Pip crosses paths with a convict named Magwitch, a man who will heavily influence Pip’s adulthood. Meanwhile, the earnest young man falls for the beautiful Estella, the adoptive daughter of the affluent and eccentric Miss Havisham. Widely considered to be Dickens's last great book, the story is steeped in romance and features the writer's familiar themes of crime, punishment, and societal struggle. Express Arts presented a creative fun filled day of crafts, drama and puppetry for ages 6+ during February Half Term! On Wednesday 22nd February young people were able to discover different art forms, with mask making, paper puppets and drama while gaining an arts award, which is a national recognised qualification. The day was funded by Warrington Borough Council and was a free opportunity! Express Arts brought Warrington their take on Macbeth, the infamous Shakespearean Scottish tragedy that dictates the bloody consequences of a couples’ malicious rise to power. "Power hungry and blinded by greed and supernatural premonitions, Macbeth and his ambitious wife find themselves tangled in a web of deceit and murder and will do whatever it takes to get what they want. As time passes and more heinous crimes are committed, Macbeth learns to revel in his new found supremacy; however remorse takes its toll on Lady Macbeth’s conscience and Insomnia and madness overcome her guilt ridden life. As news of an uprising is imminent from neighbouring England, what is to become of the country as this once headstrong power couple begin to crumble and spiral out of control."